Despite its relatively small size, Fenway Park's oblong layout actually makes it a reasonably viable facility for various forms of football. 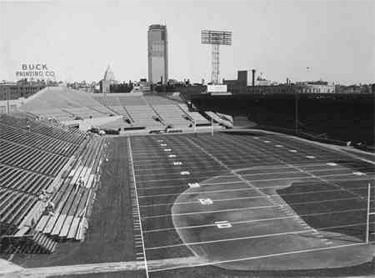 In 1926, the first American Football League's Boston Bulldogs played at both Fenway and Braves Field; the Boston Shamrocks of the second AFL did the same in 1936 and 1937. 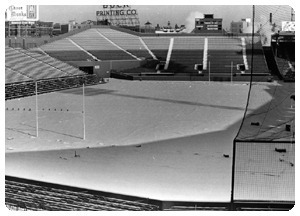 The National Football League's Boston Redskins (later becoming the Washington Redskins) played at Fenway for four seasons, 1933 to 1936, after playing their inaugural season in 1932 at Braves Field as the Boston Braves; the Boston Yanks (now the Indianapolis Colts) played there in the 1940s; and the American Football League's Boston Patriots called Fenway Park home from 1963 to 1968 after moving there from Nickerson Field, the direct descendant of Braves Field. At various times in the past, Dartmouth College, Boston College and Boston University teams have also played football games at Fenway Park.